On May 23, 2018, Nick Scala of Conn Maciel Carey’s national MSHA Practice, presented a webinar regarding MSHA’s Final Rule for Metal/Nonmetal Workplace Examinations. With all the delays, pauses and changes endured since MSHA first released its Final Rule for the Examination of Working Places in Metal/Nonmetal Mines, it is hard to believe that was just in January 2017. While the industry has braced for the rule to go into effect on several different dates since that release, there has been consistent opposition and toe dragging to putting it into action. This webinar reviewed the evolution of the rule since its first proposal, and outline elements that operators, and independent contractors must adhere to when it goes into effect. Best practices to avoid potential enforcement by MSHA. Here is a link to a recording of the webinar with slides and audio. This was the third webinar event in the 2018 Conn Maciel Carey MSHA Webinar Series. Plan to join us for the rest of the webinars in the 2018 series, send an email to info@connmaciel.com to be registered for all the 2018 MSHA webinars. On March 14, 2018, Nick Scala of Conn Maciel Carey’s national MSHA Practice, presented a webinar regarding MSHA Jurisdiction: Where Does It Begin and End?. The Mine Act of 1977 governs all mine operators, and grants MSHA authority over the industry. While the agency clearly has the power to regulate and inspect active mining operations around the country, its reach has limits, and stakeholders should be aware of when it is appropriate to challenge MSHA’s grasp. This webinar will review the limits of MSHA’s jurisdiction, beginning with the OSHA/MSHA Interagency Agreement up until the recent 6th Circuit decision in Maxxim Rebuild. How to challenge MSHA attempts to inspect operations and facilities outside their jurisdiction. Here is a link to a recording of the webinar with slides and audio. This was the second webinar event in the 2018 Conn Maciel Carey MSHA Webinar Series. 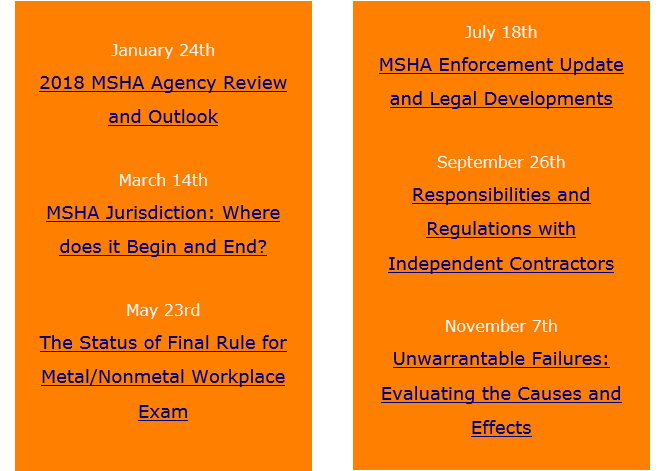 Plan to join us for the rest of the webinars in the 2018 series, send an email to info@connmaciel.com to be registered for all the 2018 MSHA webinars. Bringing a longstanding rulemaking item to fruition, MSHA issued its final rule for workplace examination requirements in Metal/Nonmetal (“M/NM”) mines on April 9th. This rule has been well publicized, and much debated within the industry, but production operators and independent contractors must prepare to comply with its changes as it becomes effective June 2, 2018. At the same time, MSHA published a document concurrent with the rule providing notice of stakeholder meetings. These conferences are designed to help the mining sector achieve compliance with the exam requirements and to assist with any concerns in the industry about the rule’s final form. This regulation takes effect on June 2, so there is only a short window to make sure the examinations are conducted in accordance with MSHA’s requirements. However, the National Sand Stone & Gravel Association recently reported that MSHA will not issue citations for alleged violations under new requirements until October 1, 2018, unless egregious conditions are observed (a policy also announced by MSHA at recent stakeholder meetings). Consistent with earlier revisions, MSHA’s final rule amends §§ 56.18002(a) and 57.18002(a), § 56.18002(b) and (c), and § 57.18002(b) and (c), as done in the rule published last year. All choices involve costs. That’s axiomatic in the field of economics. The U.S. government imposed tariffs on steel and aluminum imports this week using presidential authority under the Trade Expansion Act of 1962 and the Trade Act of 1974 upon a finding that increasing steel imports and the reduction in domestic steel-making capacity impairs the national security of the United States. The new tariffs will become effective on March 23. These new tariffs, however, could disrupt exports of US metallurgical coal, one of the bright spots in the domestic coal industry that we wrote about last year. As an example, Brazil is a major consumer of U.S. met coal and its Ministers of Foreign Affairs and Industry and Industry, Foreign Trade and Services responded to the U.S. tariffs, stating that Brazil has a “preference for dialogue and partnership, [but] Brazil reaffirms that it will take all necessary steps, both bilaterally and multilaterally, to preserve its rights and interests.” Brazil is the second-largest source of steel imports to the United States after Canada which has been exempted from the new tariffs. But Brazil also is dependent upon imports of metallurgical coal for its steel mills because its own coal resources are of poor quality and support only power applications. Brazil’s coal imports are nearly $2.8 billion (USD) per year with more than a third of that coming from coal mines in the United States. Brazil’s ministers also pointed out that its steel exports are semi-finished products that are used as inputs in the North American steel industry. Metallurgical coal exports experienced a year-over-year volume increase of 38.2% between 2016 and 2017. And this demand increase drove significant increases in average prices to importing countries. The upswing in metallurgical coal production also saw a rise in injury and fatality rates in the coal industry from 2016 to 2017. But even with the cuts and reallocation of MSHA’s coal-enforcement resources outlined in our previous post, MSHA completed 100% of its scheduled coal mine inspections with a 15 % increase in citations or orders issued to the coal industry. In fact, while the deregulation of coal mines garnered significant attention during the 2016 presidential election, mine safety and health regulations remain largely untouched by the current administration. On January 24, 2018, Nick Scala of Conn Maciel Carey’s national MSHA Practice, presented a webinar regarding 2018 [MSHA] Agency Review and Outlook. With 2017 behind us, it’s time to look forward to what MSHA has in store for the next year. To close the year, the agency rounded out its leadership with the confirmation of Assistant Secretary Zatezalo and began review of pending and new rulemaking efforts. This groundwork will shape the future of MSHA during the Trump administration over the next three years. This webinar will review the new MSHA leadership team, developments in rulemaking and enforcement, and other issues of importance for the nation’s mine operators. Areas ripe for change under the first full year of a Trump Administration MSHA. Here is a link to a recording of the webinar with slides and audio. This was the first webinar event in the 2018 Conn Maciel Carey MSHA Webinar Series. Plan to join us for the rest of the webinars in the 2018 series, send an email to info@connmaciel.com to be registered for all the 2018 MSHA webinars. 2018 is here, and with it comes a new chapter for the mining industry under MSHA regulation. This will mark the Agency’s first full year with the Trump Administration, and it begins with MSHA’s leadership team appointed, confirmed and in place. This leaves the industry with questions regarding the status moving forward from past enforcement initiatives, such as impact inspections, Rules to Live By and pending rulemaking, while also leaving operators curious as to what new priorities will manifest as MSHA moves forward. As we push into the new year, it is as important as ever that the mining industry monitor MSHA as the policies and tone of this administration unfold. Conn Maciel Carey’s complimentary 2018 MSHA Webinar Series, hosted by the firm’s national MSHA Practice Group, is designed to give you the tools to prepare your mining operations for forthcoming initiatives, rulemaking and enforcement for 2018 and beyond. To register for an individual webinar, click the link below the program description. To register for the entire 2018 series, click here to send us an email request, and we will register you. If you missed any programs from prior years, here’s a link to an archive or recordings for those webinars. Washington, D.C.-based OSHA/MSHA and Labor & Employment law firm Conn Maciel Carey LLP is pleased to announce the launch of a Midwest Office in Chicago, IL and the addition of two prominent Chicago attorneys – Aaron R. Gelb and Mark M. Trapp. Mr. Gelb, former Labor & Employment Shareholder and head of the OSHA Practice at Vedder Price PC, in its Chicago office, represents employers in all aspects of the employer-employee relationship. Aaron’s practice has a particular emphasis on advising and representing clients in relation to inspections, investigations, and enforcement actions involving federal OSHA and state OSH programs, and managing the full range of litigation against OSHA. Aaron also has extensive experience litigating equal employment opportunity matters in federal and state courts having tried a number of cases to verdict and defending employers before the EEOC as well as fair employment agencies across the country. In the past 5 years alone, Aaron has successfully handled more than 250 discrimination charges. Mr. Trapp joins the firm with seventeen years of experience, during which he has represented employers in all types of labor disputes, from union campaigns and collective bargaining to grievances and arbitrations. Mr. Trapp has defended employers before administrative agencies and in litigation brought under the ADA, ADEA, Title VII and other federal anti-discrimination laws. Mr. Trapp is perhaps best known as a leading authority on multi-employer pension withdrawal liability. His articles on withdrawal liability and other labor and employment issues have been published in respected legal publications. “I have worked with Mark for over a decade at various law firms, so I am excited that he has joined our boutique practice that focuses on positive client solutions and effective client service. His unique knowledge of traditional labor issues and multi-employer pension disputes is unparalleled and he has proven to be a creative and out-of-the-box adviser when counseling clients,”Kara M. Maciel, Chair of the Labor & Employment Practice reported. Here is a link to a press release issued by the Firm about these exciting developments. On December 14, 2017, Nick Scala of Conn Maciel Carey’s national MSHA Practice, presented a webinar regarding Miner and Mine Manager Rights. MSHA publishes and distributes information each year on miners’ rights in the workplace. The rights widely broadcast by the agency include the right to report hazards in the workplace to MSHA, to not be discriminated against in the workplace for reporting safety defects (amongst other protected activities) and to speak to MSHA without management present. However, this is only half the story and does not include the rights of mine management personnel during inspections and investigations. During enforcement and investigations, MSHA relies heavily on miner statements and alleged admissions by mine management. Especially during special investigations, these statements can be the nails in the coffin for enforcement. Operators should be aware of the rights of all miners and mine management both cooperate with MSHA, or not, and train the workforce on their rights when dealing with MSHA. When operators and agents of management should refrain from speaking to MSHA. Here is a link to a recording of the webinar with slides and audio. This was the eleventh webinar event in the 2017 Conn Maciel Carey MSHA Webinar Series. Plan to join us for the webinar in the 2018 series, send an email to info@connmaciel.com to be registered for all the 2018 MSHA webinars. On November 29, 2017, Nick Scala of Conn Maciel Carey’s national MSHA Practice, presented a webinar regarding MSHA Recordingkeeping Requirements and Document Production. Recordkeeping requirements such as workplace exams are well-known and often discussed with MSHA inspectors, however these are far from the only records that MSHA requires operators to maintain. On top of knowing which records to keep, it is equally important that operators are aware of how long the records must be maintained. Failure to produce a required record will most likely result in a citation for failure to maintain the records, and even if the records were created but not retained long enough operators can expect a citation similar to if the record was not created at all. This webinar will provide with the tools to proficiently produce and provide to MSHA document that must be maintained for both regular inspections and recordkeeping audits under Part 50. How to react if MSHA is requesting documents not expressly required to be maintained. Here is a link to a recording of the webinar with slides and audio. This was the tenth webinar event in the 2017 Conn Maciel Carey MSHA Webinar Series. Plan to join us for the remaining webinar in the 2017 series, send an email to info@connmaciel.com to be registered for the remaining MSHA webinars. On October 26, 2017, Nick Scala of Conn Maciel Carey’s national MSHA Practice, presented a webinar regarding The Evolution of Imminent Danger Orders. The last several years, MSHA has issued 107(A) Imminent Danger orders with increased frequency. On the surface, these orders seem self-explanatory, yet the agency has been moving beyond the common assumption that these orders can only be issued when death or serious injury is imminent.. For example, some inspectors are issuing Imminent Danger orders under circumstances operators consider much less severe, and the Federal Mine Safety and Health Review Commission has been upholding them. This webinar discussed how MSHA’s application and enforcement of imminent danger orders have evolved at the close of Assistant Secretary Joe Main’s tenure, including how and why Commission decisions have bolstered this trend. Federal Mine Safety and Health Review Commission and Federal Court decisions shaping the 107(A) landscape. Here is a link to a recording of the webinar with slides and audio. This was the ninth webinar event in the 2017 Conn Maciel Carey MSHA Webinar Series. Plan to join us for the remaining webinar in the 2017 series, send an email to info@connmaciel.com to be registered for the remaining MSHA webinars.